I will tell one thing to all my friends, if I actually had a couple of blogs and my blogs are set such that relate to each other. After successfully increase google page rank on some of my blogs. So, I thought it would not hurt me to share some tips or ways that I use to increase page rank on the blog and to my friends, especially for a new venture into the world of blogging and interested to make money on the internet. Well, before I give the tips, might be good if we know in advance, what is the google page rank and the benefits. Based on the explanation from Wikipedia, Page Rank is a tool created by Larry Page and Sergey Brin to determine which sites are more popular and are eligible to appear on the main page of the google search engine. Page rank is calculated from 0-10. 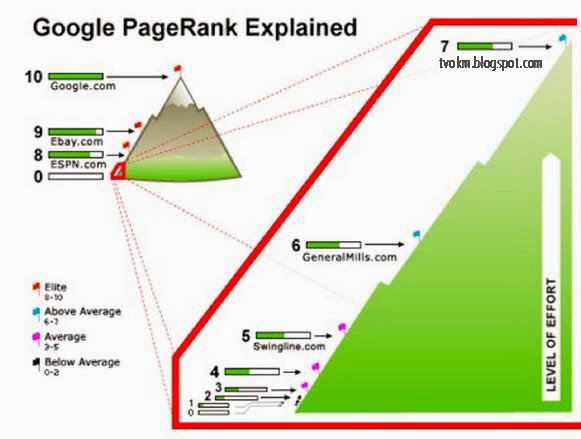 The higher the page rank, the more popular your site in search engine pages. Blogs that have higher page rank will usually get a better position on the search engine page than a blog that has a lower page rank. For example: A site that has a Page Rank of 9 will be sorted first on Google search pages than with sites that have a page rank of 8 and below. The possibility of a site visit by a user on the Internet is huge. For this reason, it is easier for advertisers to promote its product or services on the sites that have a high page rank than with a low one. In other words, the higher the page rank of your blog, the easier it is for you to make money on the internet. How does Google determine the page rank of a website? There are many ways to use the Google search engine to determine the ranking of a website. The use of Meta Tags puts an emphasis on content or unique content, inbound links, and other techniques. Link popularity is a technique which was developed to correct deficiencies in the Meta Tags technique (Meta Keywords, Meta Description) that can be used to design a page dedicated to a search engine called Doorway Pages. PageRanks has a similar concept of link popularity, which considers the "amount" of inbound and outbound links only. Also, PaeRanks assesses the quality of links pointing to a site. For example, TVOKM sites link one site that has PageRank of 2 and WFMMV sites link two sites that have PageRank of 1. So, a site that gets great results is a site TVOKM and etc. Actually, Google has its own formula to calculate the page rank of a website, using very complicated calculations. So, I will not put it here. For those of you who want to know the formula, ask teacher wiki.com. This the addresses Page Rank.